This and That » power supply - What else would it be? I now had a power supply that delivered two independent, variable outputs – but I had no easy way to hook up to the outputs, know their voltages or switch them ( without unplugging the cord ). 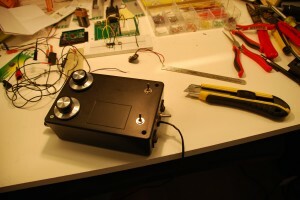 So, to round out the final product, I added some 3 amp breakers, voltmeters, switches and binding posts. Here’s a shot of the project box after drilling holes for four binding posts, main power switch, power input cord and the breakers. Connected together - lots of wires! In this shot, you can see that I’ve installed the breakers ( long black devices on the left side ), the main power switch ( red switch on left ), the power input cord feeds into the blue screw-down terminal block and the individual control switches on the lid which allow you to control each output. A whole mess of wires, but not unmanageable. BTW, I found some great strain relief grommets at Fry’s. Just drill a hole in your box, put your wire in the strain relief grommet, snap the top in place and shove it into the hole – it provides a very secure and robust wire connection that prevents putting any strain on the screw-down terminal on the PCB. Definitely keep an eye out for those. 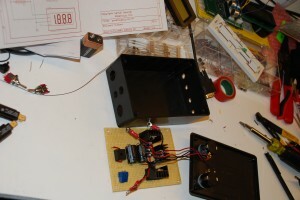 Binding posts installed, cover secured – and pumping out a near perfect 5 volts! 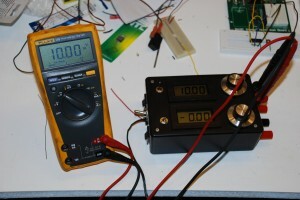 The last step is to add the voltmeters. Cutting out the holes for the digital panel meters. The meters I found were Velleman units from Fry’s. Easy to use and install, but not isolated like I mentioned before. Follow the instructions included with the unit to move the decimal point jumper ( blob-o-solder ). Most digital panel meters are shipped from the factory ready to read 0-200mV. 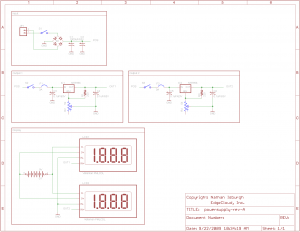 That’s not too useful for our application, so we need to follow the instructions to create a voltage divider on the input so we can display in the range of 0-20VDC. It’s actually quite simple – you remove a couple of 0402 SMT resistors, then solder in some new ones ( SMT or PTH – connections are provided for both ) – a 10M and a 100k for the 0-20VDC range, if I recall correctly. After that, hook up a battery and the sensor leads. Use your calibrated multimeter to dial in 10 VDC on your power supply, then adjust the trimpot on the back of the panel meter until it reads 10.00 VDC. Now your new panel meter is calibrated and all that’s left is mounting it in the project box! Finally! 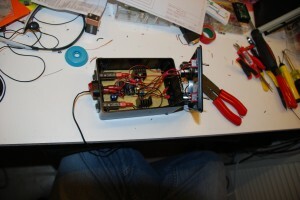 My own dual-output variable power supply! Final product! You’ll notice that the main power switch changed – I had to do this so I could switch the power to the supply and the voltmeters with one switch ( DPST ). 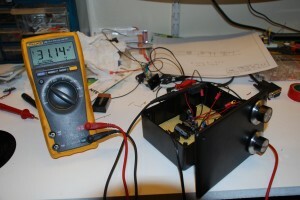 That wraps up the series on building a dual output variable power supply for the home workbench. Feel free to leave questions or suggestions in the comments! I started tinkering with electronics again recently and quickly realized the need for a good power supply. Shopping around, it became apparent that a decent dual-output unit was going to set me back quite a bit. So I started doing some research on what would be involved in a simple little power supply I could build on my own. 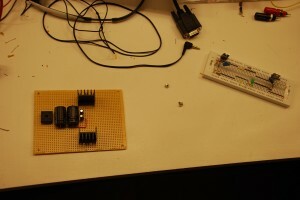 Enter the LM317 variable positive voltage regulator. Fantastic little IC capable of providing up to 1.5A and 1.2-36 volts. 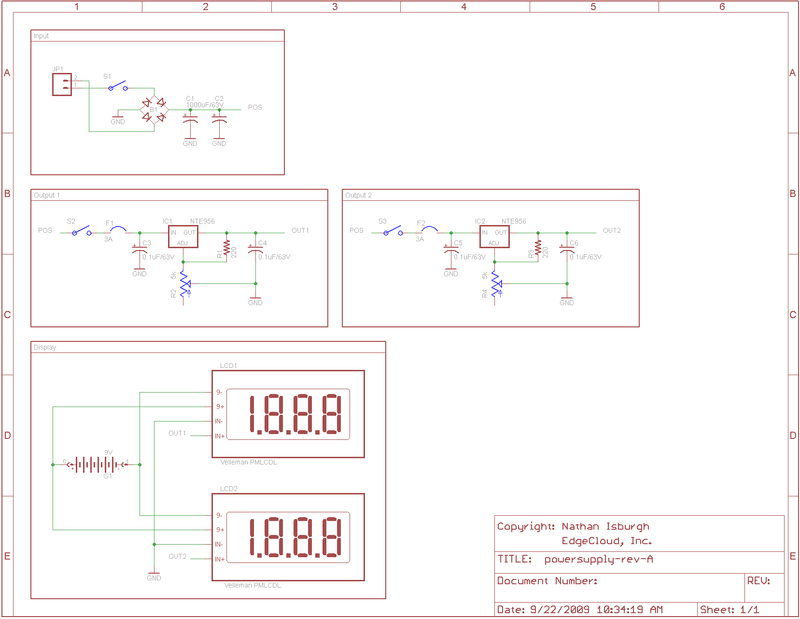 Here was the first schematic I put together from various circuit designs available around the internet. Working from left to right, we have our 120VAC input, which goes through a switch and a fuse to energize a basic 120/28 or 120/36 step down transformer. ( BTW, it’s very difficult to find a transformer of that size with the VA rating to handle a couple of these power supply circuits at full output! ). Now that we’ve stepped down our common household voltage, we rectify it using a standard bridge rectifier B1 ( 2A for safety ), followed by a large capacitor and a small one. The 1000μF cap is there to provide substantial current in the event of transient demand spikes. This large capacitor, though, does not respond very quickly, so we paired him up with a 0.1μF cap for higher frequency pulse suppression. These caps help cut down on voltage ripple in the eventual output. Next we have the workhorse of the circuit, the LM317. Note that most manufacturers that produce regulators will have something comparable to the 317. 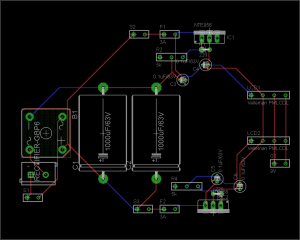 You don’t have to have the actual National Semiconductor part for this project ( I don’t! I use an NTE956 because it was readily available at Fry’s Electronics ). 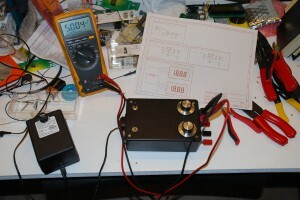 Any 1.2V-36V variable positive voltage regulator with a 1.5A output will do fine. Double check that pinout! Anyhow, the 220Ω resistor ties back in to the adjust pin as feedback gain, which you then pull down with the 5kΩ potentiometer. The more current fed into adjust, the higher the output voltage. Hence, as you increase resistance on the pot, you increase the output voltage! All the way up to about 36VDC! BTW, another fantastic feature about these regulators is that they’re extremely hardy, with built-in overload and thermal protection features. Finishing up the circuit walkthrough, we have one more cap, C4, rated at 0.1μF, for further noise suppression and to hopefully limit our voltage ripple to an acceptable level. Once I get a good oscilloscope, I’ll let you know what the actual ripple is. 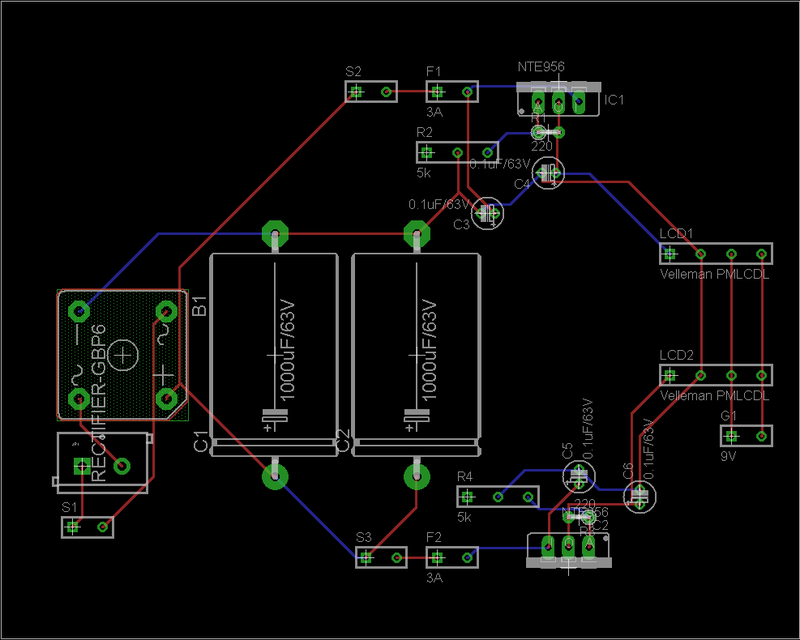 In later posts, I’ll cover the ongoing construction of this project, along with adding a second output and voltmeter displays.